The Orion Illuminated Desk Globe features striking black oceans and a sleek steel base. The colorful map detail includes the latest cartography, yet has a vintage 1950s appearance. With the flip of a switch, the acrylic globe ball emits a beautiful glow. Spins freely on a calibrated diecast semi-meridian. 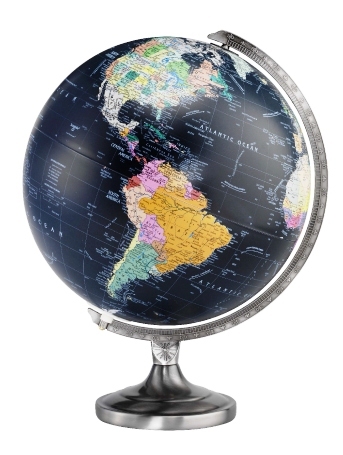 Replogle's Orion Illuminated Desk Globe is backed by a one year warranty.